You are shone to be Gideon the Venerable Martyr of Christ. On the thirtieth the hands and feet of Gideon were severed by a sword. 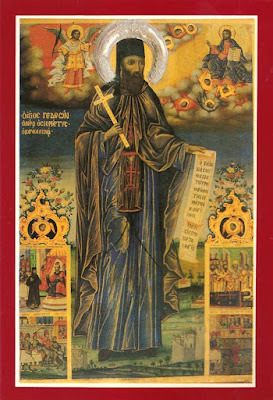 The Saint was from the town of Kapourna near Makrynitsa of Pelion. He had pious parents, Avgerinos and Kyratza, and he was the first of eight children in the family. His baptismal name was Nicholas. Because of the heavy taxation imposed on the Christian population by the Ottomans, his father was forced to move the family to the village of Gierme, where he could save the money as needed. The Saint was then twelve years old. His mother had a cousin named John who was a grocer in Velestino, who sought the young Nicholas to help in his store. The child worked with great diligence, grateful for the job opportunity. At one time a Turk named Ali, who frequented the grocery store, saw that the young Nicholas was bright, hard-working and obedient, and sought him from his uncle for one year to work in his harem, as he was still of a young age. The uncle refused, telling him to ask his mother for him. After one week the Turk returned angered, seized the young Nicholas by force, and took him to his house to serve in his harem. After a year his father went and sought Nicholas from Ali. He responded, “I have a child in the war. As soon as my son returns, come and get your son.” Ten days later the son of the Turk returned from the war, and seeing the child, he told his father: “Where did you find this Roman [Greek] child to work in your harem? It's incompatible to have a Roman work in a harem. I would want to have him circumcised, to become his sponsor and to have him work in the harem always." And immediately the impious Ali began to flatter and tempt Nicholas to accept Islam. In the end, because of his arguments and the youth's young age, he convinced him to deny Christ and to convert to Islam. Nicholas was renamed Ibrahim after his circumcision. After two months however, the child understood his fall, and he repented and cried bitterly that he accepted the circumcision of the Muslims, which he now regarded as the seal of Satan. There in Keramidi he managed for the young Nicholas to be housed by a nun who they were related to, who gave him to some builders as a helper. After a few days the group of builders who were working left by boat for Crete and took him with them. The builders however, unfortunately, abused Nicholas and beat him inhumanely many times. Thus he left and hid in a forest, taking with him some wheat meal to have as food. There he made a fire and kneaded and prepared the meal, making twelve ring biscuits (koulouria). He remained in the forest for twelve days, until he had eaten all his food. As he left he found a small chapel, where the Divine Liturgy was happening. A priest saw this stranger in a poor condition, and asked him to recount his life to him. “Don't cry, my child,” the priest told him. “I had an only son who died a few days ago. If you want, I can make you my son.” With great joy he accepted the priest's offer and Nicholas went with him to his home, where he and his presbytera took him in as their son. Thus he lived happily in the priest's house, learning the priest's trade of weaving. After three years however, the priest died, and his presbytera, because she couldn't support him along with their two daughters, gave Nicholas her blessing to leave to seek his fortune. Nicholas wept over the situation, and after embracing his new family, he departed. 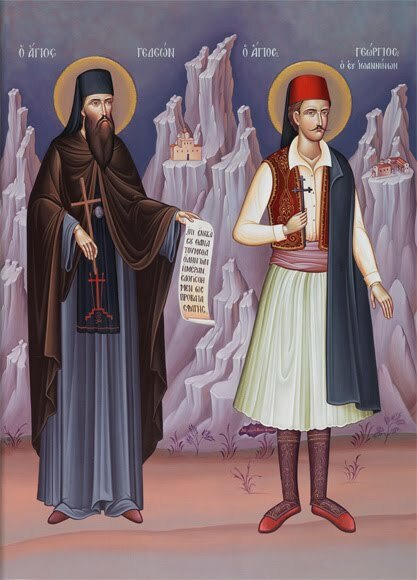 Wandering around Crete with one of his peers, they decided to go on a pilgrimage to Mount Athos. Once they reached Daphne by boat, they separated, and Nicholas began to visit the monasteries and sketes of the Holy Mountain. In the end he reached the Holy Monastery of the Apostles Peter and Paul at Karakallou, where he confessed his fall and he re-entered the Church through the anointing of Holy Chrismation and communed the Divine Mysteries. He remained in the monastery, where he became a monk and took the name Gideon. He lived with great obedience, humility, abstinence and countless ascetic struggles, which only God Who knows the heart knows, weeping continually for his fall. There he labored under the duty of cleaning and beautifying the church of the monastery. 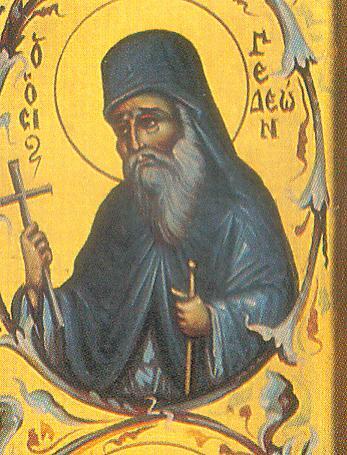 Because the monastery was then idiorrhythmic, it was determined on 6 June 1797 that Gideon should serve under Father Gabriel at the Metochion of the Transfiguration in Crete for six years. After doing this, he returned to Karakallou. 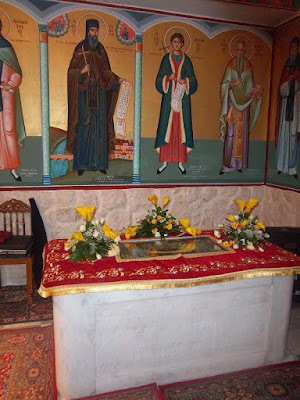 After thirty-five years of ascesis, the desire for martyrdom was lit within his heart, and with the blessings of the fathers he left the Holy Mountain and traveled to Zagora, northeast of Volos, and finally arrived at Velestino, where he had accepted Islam. There he began to play the fool. On Holy Thursday of Holy Week, Gideon was wearing on his head a wreath of roses and flowers, simply in order to appear like a fool. In this way he presented himself before Ali, who had him made a Muslim, and confessed Christ. The Turk at first didn't recognize him, but after he did he immediately sought to arrest him and lead him to the judge. On Holy Friday the Saint, wearing a crown of flowers and holding two red eggs, appeared before the judge saying: “Christ is risen.” There at the place of judgment, he did other strange actions which caused the judge to order him beat mercilessly and to throw him out as crazy. Among the things he did was throw the coffee that was served him on the face of the judge. He sought for them to deliberately put him to death, but it was not yet the will of God. He lived for some time appearing as a fool by day, but by night he withdrew to a cave, where he performed his ascetic feats. Meanwhile, Gideon did all he could to ignite the fury of the Turks against him. He kicked and trampled a Muslim woman leaving a mosque for no reason, and for this the Muslim men rushed at him and beat him till he was nearly dead. The Turks then took him to the village of Tabigli, about an hour from Velestino, and there he stayed and recovered at the house of his sister Daphne. There he suffered from his wounds for three months. One day three soldiers of Veli Pasha were passing through the village, and the elders of the community assigned for Daphne to give them hospitality. As the Muslims were sitting in her home, Gideon went up to their faces and confessed Christ. Offended by this, Gideon then challenged them to a feat that would determine who belonged to the true faith. He told a Turk to stretch out his hand and have a lit coal placed on it, and if he endured the pain he would embrace Islam. The Turk returned the challenge to Gideon. Gideon accepted without hesitation, and stretched out his hand. A lit coal was placed on his hand, and it indeed burned his flesh, bubbling and blistering it, but he persevered and won the admiration of the soldiers. But then Gideon's nephew walked in and knocked the coal out of his hand, to the dismay of Gideon. The soldiers then got up and left. Gideon then wrapped up his hand in bandages and went to the village of Kanalia, northwest of Volos. A certain Christian woman asked him there: "Why is your hand wrapped?" He replied joyfully: "Yesterday I put it to the test; but it seems it shall have much more to suffer." Now the Saint continued to do many things to vex the Turks, but they merely deemed him a madman and tolerated him. Perceiving that he was not achieving his desired end, Gideon left about an hours distance away to the upper part of Velestino, where he retired in a cave and prayed unceasingly, enduring hardships. 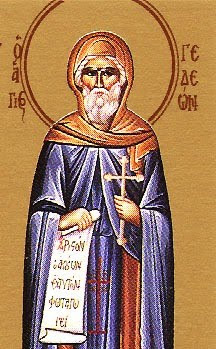 Gideon then decided to return to Mount Athos, and along the way he tried to irritate as many Turks as he could to achieve his desired end, but to no avail. Arriving at Karakallou, he resumed his duties as ecclesiarch. 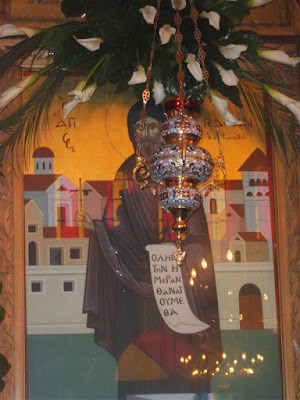 One night, as he was praying in the church alone, below the chandelier of many oil lamps (polyelaios), he heard a heavenly voice as if coming from the icon of Christ, say to him: "Whosoever shall deny Me before men, him will I also deny before My Father Who is in the heavens." Immediately after this revelation, Gideon received the blessing to continue his quest for martyrdom. Arriving again at Velestino, he presented himself before the judge and confessed loudly his faith in Christ. For his outburst, he was beaten mercilessly with staves and cast out. He then presented himself to a Turkish authority in Agria, speaking of the vileness of Islam. The Turkish official wanted to put him to death for this, but instead wrote Veli Pasha in Tyrnovos to have him transferred to him. Along the way the soldiers who escorted him allowed him to enter a church and receive Holy Communion. Standing before the governor, Gideon boldly confessed Christ after saying how he was duped in his youth by a certain Turk into accepting Islam, which he now abhorred. The governor then had Gideon imprisoned. The following day, the governor invited other Ottoman officials to come and help him examine Gideon. The officials came to Tyrnavos, and at first they used flatteries to persuade Gideon to renounce Christ, and when these did not work they turned to threats. When Gideon could not be persuaded by their threats either, they advised the governor to have him put to death. Thus the governor ordered the head of Gideon to be shaven, and to have a sheep's stomach placed on his bare head. He was then mounted on a donkey but made to sit on it backwards compelling him to take hold of the donkey's tail. The donkey was then driven throughout the streets of Tyrnavos, and while the Muslims jeered and insulted him, Gideon glorified God considering it all to be an honor. When the Turks observed the martyr rejoicing, they were put to shame and became gloomy. Christian observers in turn were also filled with joy, being made worthy to witness a Christian martyr in their own time before them. Thus with much pomp they followed the Saint to the palace of the governor, where the officers took Gideon off the donkey in the courtyard. As the governor watched this, he ordered for the hands and feet of Gideon to be severed with an axe. Before this was done, the martyr made the sign of the Cross over himself for the final time. Though the executioner, who revered the Saint, did not want to carry out the order, he was encouraged to do so by Saint Gideon himself. The Saint extended his limbs on his own without fear on the chopping block for them to be cut, without showing any sign of pain, without even showing any expression of one suffering, as if someone else were suffering. Now it should be noted that it was the end of December and cold outside, but Gideon, who made no noise of suffering and pain, lay on the courtyard as if it was Paradise. They left him bloody all day, and at night the Pasha ordered them to lift him up and throw him in a place where the waste ran from his house. He was still alive. At the fourth hour of the night, a newly-illumined Christian named Constantine, who had formerly been a Jew, went and spoke to the Saint who lay in the cesspool, seeking his blessing. He then, having just been baptized, asked the Saint to perform a miracle for him in order to confirm his faith. Though at first hesitating, Gideon condescended to the young man's request, and made this prophecy: "The palace of the governor, before the year is finished, shall be destroyed, and then shall come the beginning of the complete catastrophe of the Turks." When the young man heard this prophecy, he took counsel with his sponsor Elizabeth Euthymiou, who enjoined him to keep it a secret. Soon after, in that filthy place, the Saint gave up his spirit. It was the 30th of December, in the year 1818. 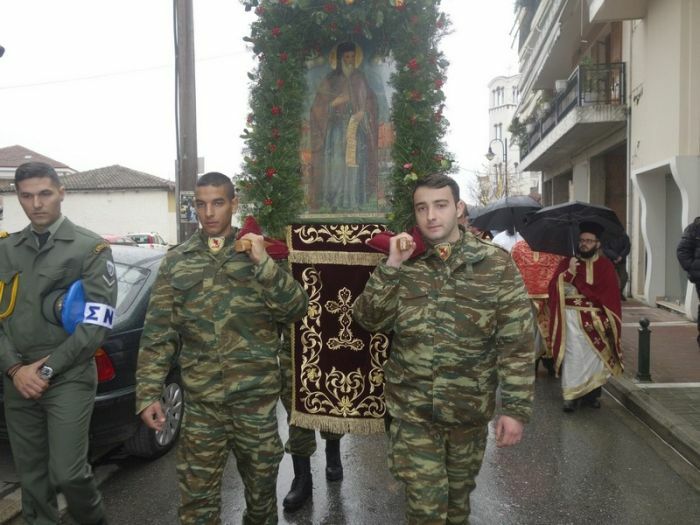 The Christians managed to bribe the soldiers for the holy relic and they took it and buried it in the Church of the Holy Apostles in Tyrnavos. 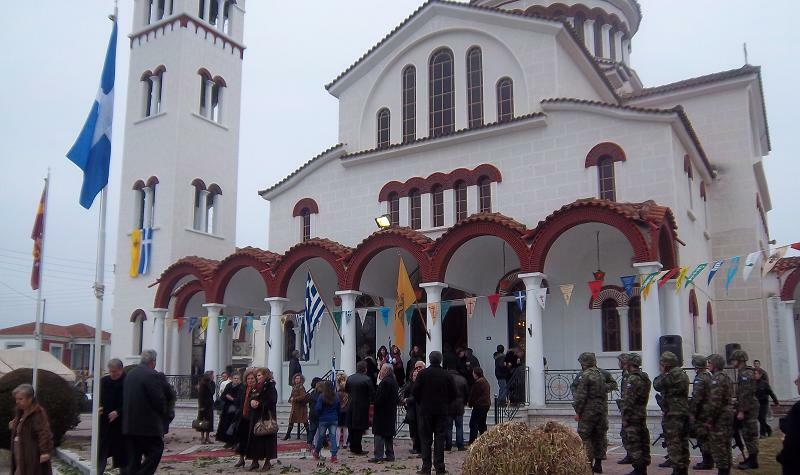 The funeral for the New Martyr was performed by Metropolitan Theodosios II of Larisa. As they were interring the martyr, a certain maiden came forth with cotton in her hand in order to gather up some of his blood, for her mistress was suffering from an incurable disease. Seeing that he was already covered in a linen shroud, she was prevented from doing this, however when Euthymios Doukas, who was the chief secretary of the governor, saw her piety, he took out his knife and cut through the sewn up linen, and with his left hand he caught some blood with the cotton. The linen was again sewn, but Euthymios observed afterwards that the entire shroud was now full of blood. In fact, warm blood was running from the bodily members of the Saint, thirty hours after the amputations and twenty-four hours after his death. All were awe-struck by this, since warm blood does not flow from a dead body. The Christians then collected the warm blood for their sanctification. 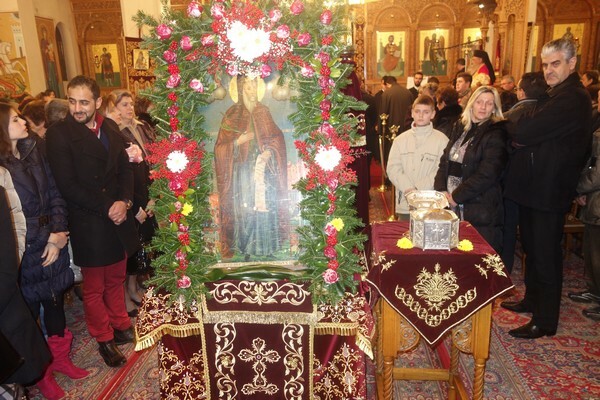 Then the body of the Holy Martyr was buried behind the sacred bema of the church, with a marble candelabrum placed on top. Therefore those who besought the Saint and sought for a cure, would light a candle over his tomb and receive healing. These miracles did not only take place then, but also in our own days. The following year, on the 24th of March in the year 1819, the two governors were killed by the Sultan and the governor's palace was utterly demolished, in accordance with the prophecy of the Saint to young Constantine. Now Gideon remained in his tomb for nineteen years until 1837. 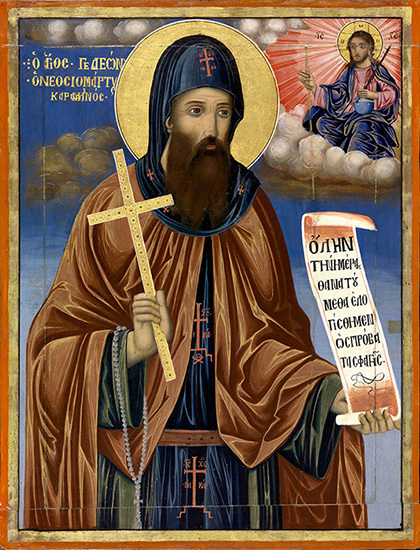 Then the abbot of Karakallou, Prokopios, dispatched Father Gabriel, who was from Makrynitsa of Demetrias, with a letter to Tyrnavos seeking the relics of the Saint. 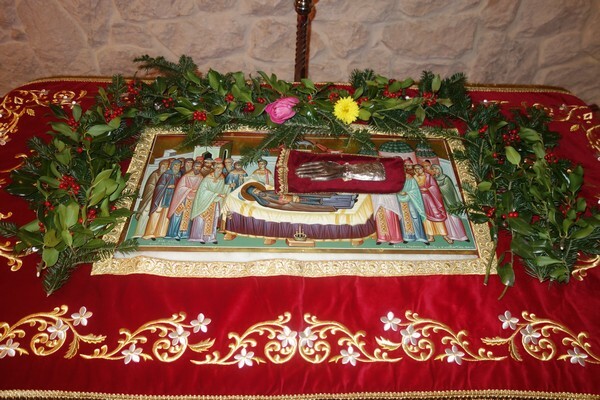 Two months earlier, the relics were translated after a revelation from the Saint, and they now resided in the home of a pious Christian named Mitakos. The Saint had told Mitakos to transfer them to his home, so he went with his three sons that night and executed the transfer in a reverent manner. 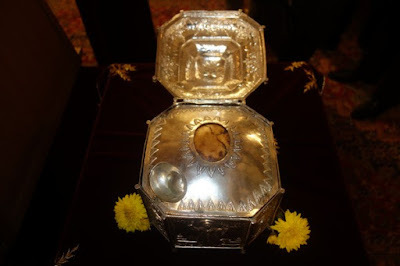 The holy relics were then placed in a chest in a room of his house, where he regularly lit an oil lamp. 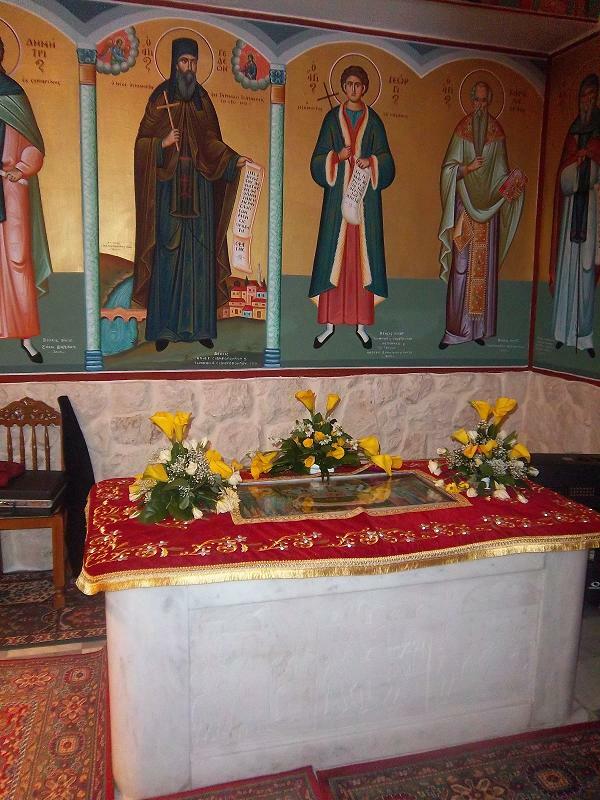 In this room, another night, as Mitakos entered to say his customary prayers, the Saint appeared before him filled with light and giving off a sweet fragrance. At first he thought there was a fire in the house, so he shouted to everyone in the house to help him put out the fire, but upon closer examination he perceived the supernatural sign, and gave glory to God and His Saint. 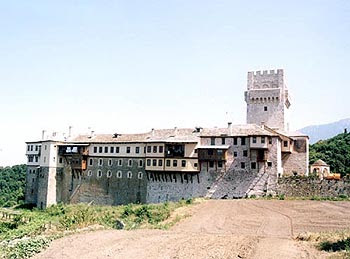 After two months, when Hieromonk Gabriel arrived in Tyrnavos, he received a portion of the Saint's foot, hand and chin, which were transferred to Karakallou on Mount Athos. There the fathers received the relics with much rejoicing and enthusiasm. It should be noted that he is the only registered Saint associated with Karakallou Monastery. 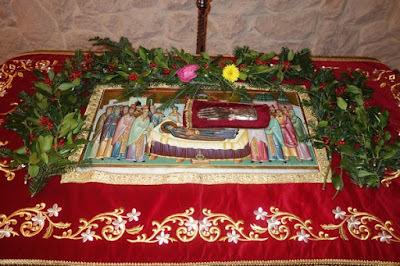 The head of the Saint rests in the Metropolitan Church of Panagia Phaneromeni in Tyrnavos. Equal in honor to the Venerables, and a communicant with the Champions, and divine boast of Karakallou Monastery, you were shone O blessed one, you struggled strongly, and deposed the enemy, therefore O Venerable Martyr Gideon, you were glorified, intercede for us all of us who praise you. 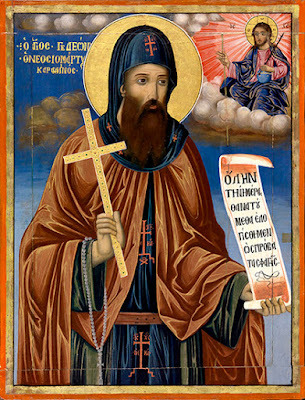 Beforehand in asceticism, you excelled divinely-minded one, and later in the contest, you were glorified in a divinely-marvelous manner; persevering in unendurable pain, you shamed, the methods of the enemy to the end; for this we honor you, glorious Venerable Martyr Gideon. Rejoice imitator of the Venerables, rejoice member and zealot of the Martyrs, for you observed both eminently, being a Venerable Martyr, divinely-inspired Gideon.